I have always been a huge fan of Australian Shiraz, especially those from the Barossa Valley. 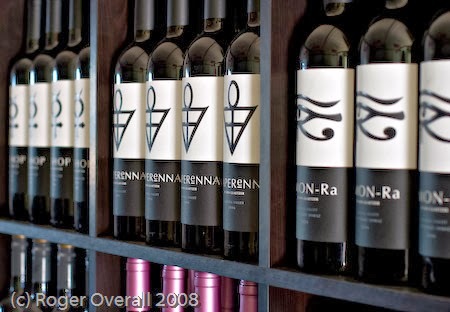 Located in South East Australia, approximately 60km North of Adelaide, Barossa is famous for its red wines. In particular, Shiraz and Cabernet Sauvignon. It is also host of one of Australia's most famous wineries, Penfolds. However, one of the major 'up and coming stars' of the area is Ben Glaetzer and his small yet quality packed range of red wines with their mythological, beautiful and minimalist labels. 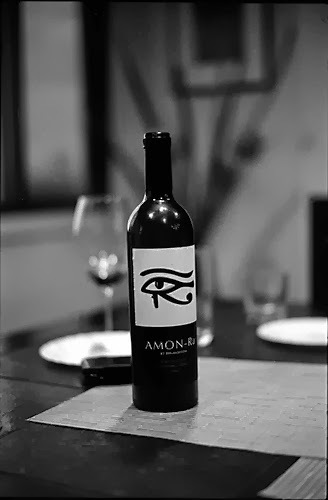 The Amon-Ra (Egyptian King of all God's) is their signature wine, their top dog, their 'Godly wine' if you will. My Father has been a fan of his wines for a while now and has been harbouring a few bottles in his collection for about 6 years. One of these was the Amon-Ra 2004. Known as a good vintage for Glaetzer, you can understand that we had been looking forward to cracking this open for quite a while. We felt it was ready to drink over Christmas, so we cracked it open over the Turkey dinner alongside a 2001 Chateauneuf-du-Pape. Although the Chateauneuf was a worthy adversary, there was one clear winner on the day. Taken from 105-115 year old Shiraz Vines, the grapes go through primary and malolactic fermentation in oak before a 15 month maturation process on the lees all in 100% new oak barrels. The wine, by nature, begins full of intense plum fruit character, hard, grippy tannins and a beautifully deep, vibrant black/purple colour. With this in mind, we knew that this wine would develop well in bottle and with all of the processes the wine had been through, would soften, maintain its fruity character and combine brilliantly with the new oak 10 years down the line. It is safe to say we weren't disappointed. Although still deep and full in the glass, the nose is predominantly vanilla, plum and that typical cedar oak character. The palate was stunning. Silky smooth tannin's, plum, tobacco, chocolate and cedar are all detected, but in perfect balance. There is nothing to overpower the wine, all flavours and tertiary characteristics combining to make a refined, delicate and elegant wine. Although this wine could have aged slightly longer, we caught it just right. Despite loving young, full, punchy wines from South America, I always believe top quality wines from Australia should be left to age. The ripeness of the grapes and intensity of flavours although delicious, can be overwhelming to begin with. And if you're a fan of oak character, an extra 2-3 years in bottle can make all the difference. Although not difficult to get hold of, Ben's wines sadly don't come cheap. And as the Amon-Ra is his signature wine, you're looking at spending £50 per bottle minimum from most retailers (mainly the Enotria Group). And that is just for the newer vintages (although the 2012 is supposed to be one of his best yet). However, if you're lucky enough to be a member of The Wine Society (can you tell I work for them? ), you can get the 2012 at £45 per bottle. If that is still past the limit, which I understand, Ben does have three other wines to try: Anaperenna, Bishop and Wallace. Despite still not being 'cheap', they are fantastic wines and just as easy to obtain. This really is one of my favourite wines and certainly one of the finest I have ever tried. So if you're looking for a quality Aussie drop that is going to age brilliantly and you don't want to splash out crazy money on Penfold's Grange, this is the one for you.